Police at the scene of the incident. 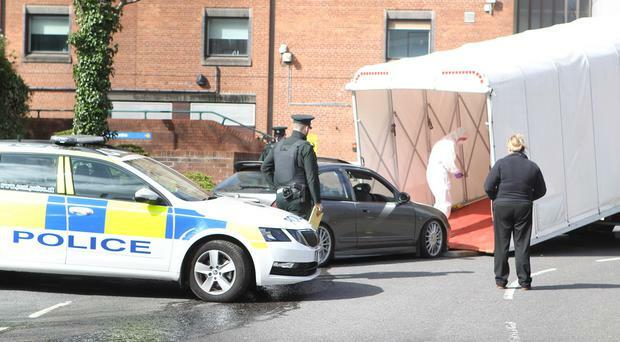 Police have confirmed a body found beside a car at the gates of Belfast's City Hospital was the cause of an incident at the gates on Sunday morning. An area close to the hospital on the Lisburn Road was cordoned off and forensic officers attended the scene from Sunday morning and into the afternoon. A car was covered in a police forensic tent. There had been unconfirmed reports of a possible shooting as well as a body found at the scene, however, police later confirmed they were investigating a death in connection with a crash in Castlereagh. The Belfast Trust confirmed the incident had happened on its grounds, however, it said it would be for the PSNI to comment on the matter. It remained business as usual at the hospital, however, there was disruption with entrances closed as they were within the police cordon. By 2pm police had left the scene. Belfast City Councillor Declan Boyle passed the scene on Sunday morning. He told the Belfast Telegraph there was a large police presence along with forensic officers. He said that while he could not be certain there looked to be someone inside the car. In a statement on Sunday evening, Chief Inspector Michael Gregg said: "Just before 2.35am this morning (Sunday, March 24) we received a report of a single-vehicle road traffic collision involving a silver Mercedes on Ballygowan Road in the vicinity of its junction with Manse Road in Castlereagh. "Police attended and discovered a car on its roof in an undergrowth area in the vicinity of the roundabout. Police located an injured man. "Northern Ireland Ambulance Service (NIAS), who were in attendance, transported the injured man to hospital for treatment of his injuries. "The Ballygowan Road was closed for a time, but has since re-opened. "A short time later, at 2.55am, we received a report from the NIAS they had located a female on the ground next to a grey-coloured MG car in the vicinity of Belfast City Hospital on the Lisburn Road. "Sadly, the female was subsequently pronounced deceased. A post mortem will be carried out in due course to establish the cause of death." He added: "Our investigation is at an early stage, however, we believe there is a link between the collision on Ballygowan Road in the vicinity of its junction with Manse Road, and the discovery of the teenager's body. I have a number of appeals to make this evening. "Were you in the Manse Road area/general Ballygowan area between 1am and 2:30am this morning? Did you see a car matching the description of the silver Mercedes? Did you witness the collision? Did you see any other vehicles in the time after the collision, including a grey MG? "If you were on the road at these times, please think back to what you may have seen. It's important we can track the movement of the vehicle involved to help us establish what happened. "I also want to appeal to anyone who was in the Belfast City Hospital/Lisburn Road area of the city this morning and saw a grey MG, to please call us. We need to know how this young girl was brought to the hospital, by whom and from where. "If you have information about the collision, or the circumstances surrounding the death of this young girl which you believe could assist our investigation, please, pick up the phone and call us on the non emergency number 101, quoting reference number 227 of 24/03/19. I would also urge anyone who may have captured footage of the collision on Manse Road or of the a Grey MG in the area of the City Hospital to call us.